By Keith Cowing on October 30, 2016 8:21 PM. "In a Wednesday speech in Florida, Trump slammed the Obama administration for "undermining our space program." "I will refocus its mission on space exploration," he vowed. "Under a Trump administration, Florida and America, will lead the way into the stars." Trump's remarks are in line with many congressional Republicans who have vowed to prioritize space exploration. The promise to boost exploration funding was likely welcome news for those who see America leading the world in space missions, including a high-profile effort to send astronauts to Mars within decades. But the remarks are also raising alarm among many who fear the GOP plans are a cover for slashing NASA's significant budget for climate research." By Keith Cowing on October 30, 2016 4:40 PM. Mike Pence will hold a rally at the Space Coast Convention Center in Cocoa, FL at noon tmrw (Monday) per Trump campaign website. By Keith Cowing on October 27, 2016 4:43 PM. "Dr. Wanda Austin asked Mr. Bolden to discuss how NASA plans to work with the Presidential transition teams to maintain progress on NASA's current programs and activities. Mr. Bolden explained that the Pre-Election Presidential Transition Act of 2010 allows each political party, after their nominating convention, to assemble transition teams . Beginning in August 2016, NASA will have access to those transition teams. NASA 's intent is to be proactive with the transition teams and tell them as much as possible about NASA, its programs, and the President's vision and remind them, similar to the Hippocratic Oath, first of all to "do no harm. "The Nation is embarked as the leader of the world on an ambitious space exploration program. NASA has put together a great set of science programs. It has a more robust aeronautics program than at any time in the recent history of the Agency, and a technology development program that is helping to develop the cutting edge technologies that would be needed not just for the Journey to Mars but across the NASA portfolio. NASA will not wait for the transition teams to come to NASA, but will go to them." "The Council discussed the upcoming transition in Presidential Administrations. Dr. Peterson advised that it would be important to be prepared to be proactive and present the transition teams with a plan for Mars. Mr. Hale reported that he had worked with the last transition team and learned that space policy is made at the White House. He asserted, "It is setting the expectation too high to suggest that NASA can affect the formulation of space policy." Ms. Blakey advised that it is important to know who is listened to on the transition teams." 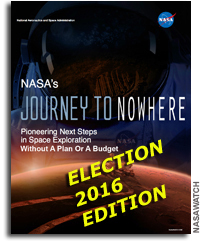 "While both Democratic presidential candidate Hillary Clinton and Republican candidate Donald Trump established transition teams after accepting their parties' nominations this summer, months ahead of the Nov. 8 general election, that planning has yet to involve "landing teams" for NASA. "We're at the point now where, any day now, we could hear about individual names for the landing team for NASA," said Michael French, NASA chief of staff, speaking at a meeting of the Federal Aviation Administration's Commercial Space Transportation Advisory Committee (COMSTAC) here. "NASA has not received this information yet." Keith's note: Interesting. With regard to presidential transition teams Charlie Bolden said "NASA will not wait for the transition teams to come to NASA, but will go to them". Now, with regard to who is on these transition teams, his chief of staff says "NASA has not received this information yet". So ... I guess no one followed Bolden's direction to seek out the transition teams. In my experience, transition teams never reveal their membership until after an election, so I am not sure he'd know who to talk to anyway . If you compare Bolden's and French's approaches they seem to be the opposite of each other. I wonder who is giving NASA HQ advice on all of this? By Keith Cowing on October 26, 2016 5:17 PM. By Keith Cowing on October 25, 2016 10:22 PM. "We are fortunate to be entering a dynamic new era in space - one that will enable us to explore new worlds, expand our scientific knowledge, push the frontiers of technological innovation, and achieve our boldest aspirations in space. This forward trajectory has been fueled by pragmatic policies that have brought together our brightest minds, and newest technologies, to forge new frontiers. As president, Secretary Clinton will not only build on our progress in space, but will advance inspirational, achievable, and affordable space initiatives." 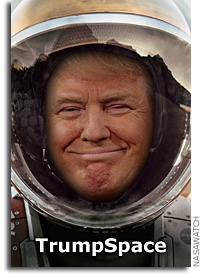 Trump Promises to "Free NASA"
By Keith Cowing on October 25, 2016 4:46 PM. By Keith Cowing on October 24, 2016 7:35 PM. "A key Trump goal will be to create lower costs through greater efficiencies. We must ensure that space products developed for one sector, but applicable to another, will be fully shared, not duplicated. It makes little sense to develop numerous launch vehicles at taxpayer cost, all with essentially the same technology and payload capacity. Coordinated policy could end such duplication of effort and could likely determine where there are private sector solutions that do not necessarily require government investment." Keith's note: A second Trump space policy op ed in 2 weeks - and still no overt mention of support for SLS/Orion, ARM, or #JourneyToMars - just the same statement that government should not be developing launch capabilities when the private sector can do so. By Keith Cowing on October 19, 2016 5:31 PM. "A 21st century space policy requires a bold combination of public missions, commercial solutions and the agility to address real threats and real opportunities. To craft such a policy, government must recognize that space is no longer the province of governments alone. Ronald Reagan anticipated this revolution long ago when he signed the 1984 Commercial Space Launch Act. ... Creating the technologies necessary to meet these goals would push us into the forefront of technological development and benefit our economy for decades to come. However, NASA cannot be expected to do this kind of 21st century Apollo-like mission if it is forced to accept outdated operational structures, contracting procedures, and bureaucracies created in the last century." Keith's note: Former congresman, veteran space consultant, and Trump advisor Robert Walker is one of the two authors of this op ed. No mention is made of SLS, Orion, or ARM - yet a list of specific commercial companies and their capabilities - Orbital ATK, SpaceX, Blue Origin, Boeing, Paragon, Sierra Nevada, United Launch Alliance, Virgin Galactic and XCOR Aerospace is included. Moreover a warning against Apollo-like missions (#JourneyToMars) is made. By Keith Cowing on October 12, 2016 9:54 PM. "TRUMP: After taking office, we will have a comprehensive review of our plans for space, and will work with Congress to set both priorities and mission." "CLINTON Today, thanks to decades of successful American robotic explorers, we know more about the universe than ever before. We have learned that asteroids have shaped life on our home planet and will likely affect our future. Their scientific value and their potential as a resource make them valuable targets for further exploration. Many of the technologies we need to send astronauts to an asteroid can also serve as foundational technologies that will be necessary to make human exploration of Mars possible. While President Kennedy set NASA on a course to win the race against Russia to get to the moon, today, human spaceflight is a global endeavor, with astronauts and cosmonauts living and working together on the International Space Station -- a remarkable facility developed with 15 international partners. America should continue to push the boundaries of space and lead a global effort of exploration. I have always been an enthusiastic supporter of human space flight. My administration will continue to invest in this worthwhile endeavor. Mars is a consensus horizon goal, though to send humans safely, we still need to advance the technologies required to mitigate the effects of long-duration, deep-space flight." By Keith Cowing on October 11, 2016 4:03 PM. "The former lead singer of the band Blink 182 was in recent contact with Hillary Clinton's campaign chairman John Podesta about UFOs, newly disclosed emails show. Tom DeLonge, who was the guitarist for the power punk trio best known for songs like "Dammit" and "What's My Age Again," emailed Mr. Podesta at least twice. He wrote in cryptic terms about their well-documented mutual interest in more government disclosure about the phenomenon of unidentified flying objects of potential extraterrestrial origin. The emails, released by the website Wikileaks this month, also reveal that Mr. Podesta participated in a documentary that Mr. DeLonge is producing. Mr. Podesta, who has worked in the highest levels of government in the administrations of Bill Clinton and Barack Obama, has expressed interested in the topic. And he has long championed further government disclosure around classified files concerning UFOs." Keith's note: WikiLeaks, Blink 182, John Podesta, and UFOs? This sounds like the premise of a South Park episode. By Keith Cowing on October 4, 2016 11:25 PM. "The Senate Commerce, Science, and Transportation Committee has advanced a NASA authorization bill that focuses on space exploration and seeks to ensure stability at the space agency through the upcoming presidential transition. Unlike the House-passed NASA authorization bill, the Senate bill has only a few provisions specific to NASA's science divisions. Whereas the House backed a sweeping authorization bill that addresses all of NASA's major programs, including providing extensive guidance to NASA's Science Mission Directorate, the Senate bill focuses on big picture strategy and ensuring stability at the agency through the upcoming presidential transition. The Senate legislation emphasizes NASA's role in space exploration, and it would formalize in statute the horizon goal of sending humans to Mars as well as support steps for getting there." By Keith Cowing on September 25, 2016 7:42 PM. "Gary Johnson might want to study up about Earth before worrying about other planets. The Libertarian Party presidential nominee -- who earlier this month infamously failed to recognize the Syrian city of Aleppo during a nationally televised interview -- said Sunday that the human race will ultimately be forced to live on other planets. "I mean, the plate tectonics at one point, Africa and South America separated and I am talking now about the Earth and the fact that we have existed for billions of years and will going forward," the gaffe-prone former New Mexico governor said on ABC's "This Week." "We do have to inhabit other planets. I mean, the future of the human race ... is space exploration. So, no, we should be prudent with the environment. We care about the environment," he said." "Look, what it points to also is the fact that we do have to inhabit other planets," Johnson continued. "The future of the human race is space exploration." Keith's note: I just deleted half a dozen posts by readers that have nothing to do with the topic of this post: space policy. If you people cannot stay on topic I will shut off comments on election 2016 posts again. By Keith Cowing on September 13, 2016 3:17 PM. "16. Space - There is a political debate over America's national approach to space exploration and use. What should America's national goals be for space exploration and earth observation from space, and what steps would your administration take to achieve them?" Hillary Clinton (D): "President Kennedy's challenge in 1962 to go to the Moon within a decade electrified the nation, prompted a long period of American leadership in science and technology, and spurred a generation of innovators. In the decades since, we have explored the sun and every planet in our solar system; mapped the surface and studied the atmosphere of Mars and confirmed the presence of water on the Red Planet; discovered new solar systems with Earth-like planets; mapped the distribution of galaxies in the universe; observed black holes, dark matter, and dark energy; built programs to monitor our ozone layer and the catastrophic impact of global climate change; and identified and mapped near-Earth asteroids as a first step to protect our planet from a major asteroid impact. The International Space Station stands as the largest and most complex international technological project in history and has been key to understanding the response of the human body to long periods in zero gravity. And in recent years, new companies have sprung up that offer the promise of innovative approaches to transporting cargo and, eventually, humans in space. Americans have always been willing to think big, take risks, and push forward. These pillars will continue to underpin what America does in space, just as they define who we are as a people. As president, my administration will build on this progress, promote innovation, and advance inspirational, achievable, and affordable space initiatives. We must maintain our nation's leadership in space with a program that balances science, technology and exploration; protect our security and the future of the planet through international collaboration and Earth systems monitoring; expand our robotic presence in the solar system; and maximize the impact of our R&D and other space program investments by promoting stronger coordination across federal agencies, and cooperation with industry. I will work with Congress to ensure that NASA has the leadership, funding and operational flexibility necessary to work in new ways with industry, placing emphasis on inventing and employing new technologies and efficiencies to get more bang for the buck while creating jobs and growing the American economy. Today, thanks to a series of successful American robotic explorers, we know more about the Red Planet than ever before. A goal of my administration will be to expand this knowledge even further and advance our ability to make human exploration of Mars a reality. As a young girl, I was so inspired by America's leadership and accomplishments in space that I wrote to NASA about becoming an astronaut. As president, I will help inspire the next generation of young Americans and do what I can to ensure that we have the world's most exciting and advanced space program, one that meets our highest human aspirations in a world where the sky is no longer the limit." Donald Trump (R): "Space exploration has given so much to America, including tremendous pride in our scientific and engineering prowess. A strong space program will encourage our children to seek STEM educational outcomes and will bring millions of jobs and trillions of dollars in investment to this country. The cascading effects of a vibrant space program are legion and can have a positive, constructive impact on the pride and direction of this country. Observation from space and exploring beyond our own space neighborhood should be priorities. We should also seek global partners, because space is not the sole property of America. All humankind benefits from reaching into the stars." Keith's note: Gary Johnson did not respond. Jill Stein is against space commerce and military uses of space. By Keith Cowing on September 4, 2016 1:36 PM. Keith's note: Someone just sent this to me - they found it on a bulletin board at the NASA center where they work. For a moment, as I started to read it, I thought it was legit. Then it became clear that it was not. Then I looked at the date on the letter. Lets just say that this letter is not real but given the way that this election has devolved since it was written it probably should be true. The original faux letter is presented below. The original can be downloaded here. Continue reading Fake NASA Political Guidance That Almost Seems Real. By Keith Cowing on August 26, 2016 9:41 PM. "Long before Stephen Bannon was CEO of Donald Trump's presidential campaign, he held a much different job - as the acting director of Biosphere 2, a $200 million scientific research facility in the mountains outside Tucson, Arizona. ... Bannon left Biosphere 2 after two years, and the project was taken over by Columbia University. (It is currently part of the University of Arizona.) But his departure was marred, as the Tucson Citizen reported at the time, by a civil lawsuit filed against Space Biosphere Ventures by the former crew members who had broken in." "Archival reports from 1993 found in the Star-Telegram archives show that Bannon was hired to take over the project at a point where it losing $12-15 million a year. Bannon was a former Goldman Sachs investment banker who ran a firm based in Los Angeles and New York that specialized in media and entertainment investments. .. Bannon's actions soon ended up as part of a civil suit filed by some of the original Biospherians against the new guard. In court, he admitted speaking angry words that echo some more recent accusations against him." "Biosphere 2 was only used twice for its original intended purposes as a closed-system experiment: once from 1991 to 1993, and the second time from March to September 1994. Both attempts, though heavily publicized, ran into problems including low amounts of food and oxygen, die-offs of many animal and plant species, squabbling among the resident scientists and management issues." By Keith Cowing on August 22, 2016 6:27 PM. By Keith Cowing on August 21, 2016 8:28 PM. "Saying NASA needs long-range political assurances, U.S. Sen. Marco Rubio declared broad backing for the space agency's agenda Friday and called on Donald Trump and Hillary Clinton to do the same. Rubio met Friday with space industry representatives and others in a roundtable discussion organized by the Economic Development Commission of Florida's Space Coast and Space Florida, the state's space industry development corporation. They heard from him what they wanted: that Florida's junior senator, seeking re-election, is behind NASA's most ambitious programs, to turn over as much lower-Earth orbit activity as possible to private companies, and focus the nation's manned space flight efforts on getting to Mars." Will ClintonTrump Ever Talk About Science Issues? By Keith Cowing on August 12, 2016 1:06 PM. "Climate change. Mental health. Space exploration. Vaccinations. The health of the oceans. Antibiotic-resistant superbugs. These are not the typical meat-and-potatoes topics of presidential debates. Often, the candidates and people who ask them questions skip over such topics entirely. But dozens of non-partisan groups that represent millions of scientists and engineers across the country are eager to change that. For the third consecutive presidential election, the folks behind ScienceDebate.org are asking candidates to hold a debate exclusively about major issues in science, engineering, health and the environment. Since that almost certainly won't happen (it didn't in 2008 or 2012, either), the organizers have put together 20 questions they are asking candidates to address in writing. Marcia McNutt, president of the National Academy of Sciences, said answers from the campaigns could help voters gauge how a candidate plans to use scientific information to make important decisions in the White House." By Keith Cowing on August 12, 2016 1:05 PM. "The Coalition for Deep Space Exploration (Coalition) is pleased one of its members, Futuramic Tool & Engineering (Futuramic), was recognized yesterday by Democratic Presidential Nominee Hillary Clinton as "being on the front lines of a manufacturing renaissance in America." ... Clinton referenced Futuramic's role in the manufacturing of SLS stating the rocket was "being built to go from Macomb (Michigan) to Mars." Keith's update: Looks like the Coalition for Deep Space Exploration's lobbying worked - almost - "NLSLS" (what she said) is not SLS - and Third World countries do build rockets. But Hillary did say "Mars". Hillary Clinton at Futuramic at an "aerospace company" - "I saw the NLSLS rocket that will go from Macomb to Mars"
Continue reading Coalition For Deep Space Exploration Wades Into Partisan Waters. By Keith Cowing on August 3, 2016 5:45 PM. By Keith Cowing on March 15, 2016 7:32 PM. Keith's note: This video from last week's Goddard Memorial Symposium features Marcia Smith, Editor, SpacePolicyOnline.com; Lori Garver, General Manager, ALPA; Chris Shank, Policy Director for the House Science, Space, and Technology Committee; Sandy Magnus, AIAA Executive Director; and Mary Lynne Dittmar, Executive Director, Coalition for Deep Space Exploration. The real discussion - bordering on a debate - was between Lori Garver and Chris Shank. You could say it was the opening salvo of space policy in the 2016 election. The most naive thing to be said came from Mary Lynne Dittmar when she got to talking about a mandate to explore space (around 1:10:00) "Why is space held to this sort of standard that we - in this country - have to come to some single consensus about what the mandate needs to be in order for us to go forward? We don't do that for almost anything else." In other words, who needs a clear reason to go build SLS (i.e. a mandate)? We should just build it and then find something to go do with it - because we want to do something, somewhere - eventually - because that's what space people do - build new things that go into space. Oh, and just send us everyone else's money when we need it. In other words space IS special - to space people. They are just are blind to the obvious and feel no compulsion to make what they are doing actually relevant to the people who pay for their party. "On one hand the space groups want to have a say in the political decisions that affect their members (and donors). But on the other hand they'd rather not have the politicians pay too much attention to space such that the current status quo is not upset. In other words "write us the checks but don't rock the boat" - or more bluntly "look but don't touch". This is, at best, naive thinking on the part of the space community." By Keith Cowing on March 8, 2016 9:41 PM. Keith's note: Last week a group of space-related organizations rented the National Press Club so they could announce a white paper on space policy. Why bother? Space is not going to be an issue in the 2016 campaign. At the press event Elliot Pulham from The Space Foundation said "We thought it would be a good time to have a platform of information out there that all candidates could refer to, learn from and take to heart as they plan their campaigns" but moments later he also said "To some extent, the purpose of this is not to have space become a big presidential issue". Pulham added "Let's not undo anything." Sandy Magnus from the AIAA said that this coalition wanted to take the issue of space policy "off the table" but at the same time she said that this group wants to "stress the importance" of space. Such is the problem with these sort of documents from the space community. On one hand the space groups want to have a say in the political decisions that affect their members (and donors). But on the other hand they'd rather not have the politicians pay too much attention to space such that the current status quo is not upset. In other words "write us the checks but don't rock the boat" - or more bluntly "look but don't touch". This is, at best, naive thinking on the part of the space community. If you read the white paper it becomes immediately apparent that this coalition wants everything that they are doing to be supported and in some cases, they want even more money. They also want a stable funding environment (makes sense). The two main programs being supported by this coalition are SLS/Orion and Commercial Crew and Cargo with gratuitous mention of other projects that are important to the members of this coalition. Indeed that is all that this white paper is actually about: supporting specific big aerospace contracts. There is no similarly identified support for specific space, planetary, and earth science. Small wonder that the Planetary Society, American Astronomical Society, the American Geophysical Union, et al are not among the members of this coalition. While a lot of prominent names are affixed to this white paper it is clearly being driven by the so-called "four amigos": Lockheed Martin, Boeing, Aerojet Rocketdyne, and Orbital ATK - the builders of SLS/Orion. Look at the organizations listed and ponder who the prime donors/members are. Its not that hard to fill in the blanks amidst the smoke and mirrors. No surprise folks - this is how these things always work. 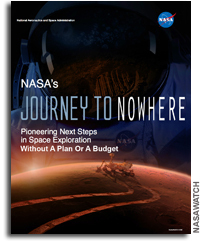 Continue reading Space Policy White Paper = Shopping List For The Journey to Nowhere. By Keith Cowing on March 3, 2016 11:58 PM. "Retired astronaut Buzz Aldrin received a standing ovation at CPAC on Thursday, speaking "not as a Republican" or as a Democrat, but as someone who is concerned that America needs to maintain its space exploration program." By Keith Cowing on March 1, 2016 2:40 PM. "Want to get to Mars? Well, NASA needs money to do it, and the president, along with Congress, mostly calls the shots. But NASA has been consistently underfunded over the last decade, and only saw its budget restored to healthier levels in 2016, when Congress carved out $19.3 billion for the agency. With missions to Mars and Jupiter on the horizon, and ambitions of curbing US dependency on Russian launches to the ISS, NASA's no doubt hoping that the next president keeps the money flowing." Keith's note: Space is just a blip on the political radar. Rarely, if ever, has it had any influence on a presidential election whatsoever - and then, it was fleeting and usually on late night comedy shows. Nor is it likely to change during this election. Besides, whatever you hear during the campaign will be revised and reinterpreted after the election. The candidates forget the issue 2 minutes after they answer a question about it. Nothing on the horizon suggests that there will be a large increase in NASA's budget. 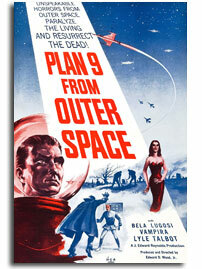 Nor is anyone really targeting NASA for drastic cuts. Given the large commitments the agency is already in the middle of, and the prospect of flat budgets, it is unlikely that there will be any seismic shifts. As for the #JourneyToMars - absent a large infusion of money (again, not likely) the current pay-as-you-go, we-don't-need-a-plan approach is simply not going to get us to Mars any sooner. The most that space advocates should hope for after the dust settles is that the agency will be held more accountable for its performance and that some budgetary and policy stability will be injected into things already underway so as to make them progress more efficiently. By Keith Cowing on February 25, 2016 10:24 AM. "Tomorrow, February 25 at 10:00 a.m. ET, the House Science Committee will hold a hearing on the need for stability at NASA through changing presidential administrations. The hearing will feature former astronaut and first female Space Shuttle pilot and commander, Colonel Eileen Collins, as well as former NASA Administrator Michael Griffin. Rep. John Culberson, chairman of the Commerce, Justice, Science (CJS) Subcommittee of the House Appropriations Committee, will also testify. Culberson is the author of legislation the Science Committee will review on Thursday, the Space Leadership Preservation Act, which is intended to bring stability to NASA despite changing presidential administrations." Keith's note: So ... would Mike Griffin entertain the notion of being Donald Trump's NASA Administrator? "I believe program cancellation decisions that are made by bureaucracies, behind closed doors, and without input by the people, are divisive, damaging, cowardly, and many times more expensive in the long run. As a shuttle commander, I would never make a huge decision without input from all the experts, even the ones I do not agree with. So what will keep us from having surprises like this that set us back years? Answer: A continuity of purpose over many years, over political administrations, and over normal changes in leadership throughout the chain of command. I know there must be ways to do this through policy, organizational structure, and strong leadership." "What might the "right path" look like? I have been clear in the past and hope to be clear now to me the most logical step beyond the ISS is an international partnership, led by the United States, to return to the Moon, this time to stay. In the course of so doing we will learn what is needed to go beyond, to go to Mars. And if, as I have long suspected, the Moon turns out to be quite an interesting and useful destination in its own right, well then, so much the better." "Our ongoing work has also found that the Space Launch System and Orion, the two largest projects in this critical stage of development, face cost, schedule, and technical risks. For example, the Space Launch System program has expended significant amounts of schedule reserve over the past year to address delays with development of the core stage, which is the Space Launch System's propellant tank and structural backbone. The Orion program continues to face design challenges, including redesigning the heat shield following the determination that the previous design used in the first flight test in December 2014 would not meet requirements for the first uncrewed flight. The standing review boards for each program have raised concerns about the programs' ability to remain within their cost and schedule baselines. If cost overruns materialize on these programs, they could have a ripple effect on the portfolio and result in the potential postponement or even force the cancellation of projects in earlier stages of development. We have ongoing work on both of these programs and we plan to issue reports on them later this summer." By Keith Cowing on February 15, 2016 4:51 PM. "Does Bernie support funding for space exploration? Bernie believes space exploration is beneficial and exciting, and is generally supportive of the National Aeronautics and Space Administration (NASA), but when it comes to a limited federal budget, Bernie's vote is to take care of the needs of struggling Americans on this planet first. In a Q&A session on the online forum reddit on May 19, 2015, Bernie wrote: "I am supportive of NASA not only because of the excitement of space exploration, but because of all the additional side benefits we receive from research in that area. Sometimes, and frankly I don't remember all of those votes, one is put in a position of having to make very very difficult choices about whether you vote to provide food for hungry kids or health care for people who have none and other programs. But, in general, I do support increasing funding for NASA." Keith's note: This is not an official Sanders campaign site, so your mileage may vary when it comes to what Sanders' official stance is on space. I doubt that there is much, if any difference, however. Of course what these Sanders fans have posted is simply a variation on the classic "why spend money in outer space when it should be spent on Earth" rationale for not supporting NASA. The millions in property damage (something that can disportionately affect "struggling Americans") that is avoided by better weather forecasting from satellite data seems to be unimportant- as are many well known benefits from space technology. Also, like it or not, 100% of the salaries paid to people by NASA are paid to people living on Earth and all of that money is spent by people on Earth who give that money to other people - on Earth. The color of the money paid to NASA employees or their contractors is precisely the same as is paid to employees (or grantees) of any other government agency or contractor and is of equal value when it comes to buying food or paying rent. Also, its sort of odd that NASA is always singled out as somehow depriving children of food when other government programs vastly greater in size (pick one) are never mentioned. The root of this common mindset is as much NASA's problem by virtue of it not explaining what it does as it is with ignorant citizenry who never bother to learn what what their government does with their tax dollars. Reminder to commenters: Stick to the topic of space policy in 2016. If you misbehave in the comments section I will delete your comments. If this turns into an other off-topic partisan food fight I will shut comments off completely. Have a nice day. By Keith Cowing on September 28, 2015 4:51 PM. Keith's note: I have already had to delete several posts by people that were needlessly partisan and/or gratuitously insulting. If NASAWatch readers are just going to go partisan and/or personal on these election postings then I am going to not allow any comments on election 2016 posts. Got that folks? Stick to policy. By Keith Cowing on July 24, 2015 2:14 PM. "Star Trek" Captain James T. Kirk is a Republican. That's what Ted Cruz wants you to think, anyway. In an interview with the New York Times, Cruz argues that what makes Kirk, well, Kirk, are the very values that define the GOP. "I think it is quite likely that Kirk is a Republican and [Jean-Luc] Picard is a Democrat," Cruz told the Times, suggesting that Picard Kirk's successor as captain of the fictional USS Enterprise is too rational to be an effective leader. Cruz clearly believes that the country would benefit from having a Kirk-like figure in the White House. But as arguments for electing a Republican go, this is not a winning one." By Keith Cowing on July 18, 2015 9:14 PM. Keith's note: In the past week I have posted two items about election 2016 - one mentioning Ted Cruz, the other mentioning Hillary Clinton. I have had to delete several dozen comments - nearly all of them under imaginary user names - that were posted/submitted which were utterly off-topic and/or made unsubstantiated personal attacks on the candidates or other individuals. I have had to shut off commenting on both posts. I am tired of this. If you people are going to turn NASAWatch into a place where people who are afraid/unwilling to even use their own names and engage in this behavior then I will not allow comments on these posts and will start to ban repeat offenders. I am not going to warn you again. Grow up or go away. By Keith Cowing on July 16, 2015 5:49 PM. "When I was a little girl, I guess I was a teenager by then 14, I think, and the space program was getting started, and I wanted to be an astronaut, and I wrote to NASA," she recounted. "And I said, 'What do I have to do to be prepared to be an astronaut?' And they wrote back and said, 'Thank you very much, but we're not taking girls,'" she remembered. "That, thankfully changed with Sally Ride and a lot of the other great women astronauts," she said. But "to be fair," she added, "I never could have qualified anyway, so you know, not something I spent a lot of time losing sleep over, but I really, really do support the space program." By Keith Cowing on July 15, 2015 10:24 AM. "But NASA is also one of the main purveyors of the satellite observations of Earth that are a basic necessity for many fields of Earth science. That's the part Cruz doesn't like: He wants to slash the agency's budget for Earth sciencesin particular, for climate change, a subject on which Cruz's theories are, in the words of one scientist, "a load of claptrap." It's not just Cruz. In the House, Republicans are forging ahead with a bill that would gut $90 million from NASA's Earth science budget. There are a couple major problems with that approach, and they make Cruz's lauding of the Pluto mission distinctly ironic and hypocritical. First, NASA is uniquely equipped among federal agencies to send satellites into space, so it would be hard to transfer its Earth research to some other outfit. (These are the very satellites, by the way, that produce the data Cruz likes to erroneously cite as evidence against global warming.)" Keith's note: Comments are closed. People have gone totally off topic and are ranting and making personal attacks. Please do not try and post comments elsewhere since they will be deleted. By Keith Cowing on July 8, 2015 10:55 PM. "If elected president in 2016, Jeb Bush would propose an increase in funding to NASA. "I'm a space guy," Bush said in a Wednesday sit-down with the New Hampshire Union Leader's editorial board. The former of governor of Florida, where a large portion of the country's aerospace industry resides, said he would also support increasing federal spending on research and development. The Obama administration proposed a half-billion dollar increase to NASA's budget earlier this year, totaling $18.5 billion for fiscal year 2016. That request could run aground in the Republican-controlled Congress, where Sen. Ted Cruz (R-Texas), a presidential candidate and the chairman of the Senate Commerce Subcommittee on Science, Space, and Competitiveness, feels that a reordering of the space agency is in order." This page is an archive of recent entries in the Election 2016 category. Election 2012 is the previous category. Election 2018 is the next category.